A new screen-printed book documenting the bus journey from Bergen to Røldal where I was artist in residence this summer has been editioned! This book was the result of a commission by IMPACT 8 International Print Conference in Dundee, under the theme of the conference "Artist as Explorer"! It is 5 x 5 x 4 cm when closed, but fully stretched would measure 3.5metres! It is a very kinetic book, and not so easy to take images of. When I was making this book there was a lot in the news about Norway's road tunnel network, a lorry caught fire in one 11km long tunnel (lots of people were evacuated, but fortunately no casualties) and just this week, a 300 tonne rock has blocked the entrance to one of the tunnels named in the book! 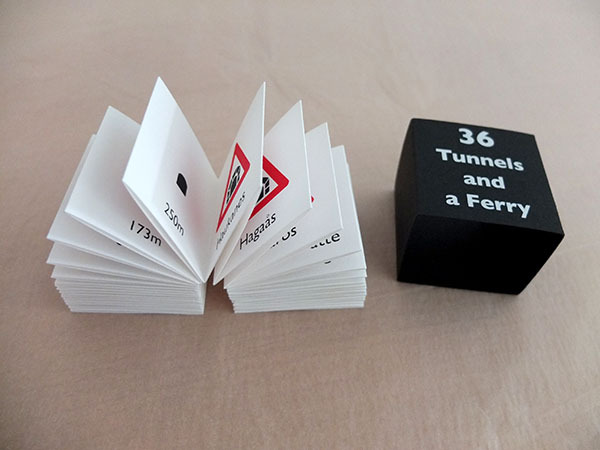 Only 25 of these small books have been produced, screen printed, cut and folded by hand.